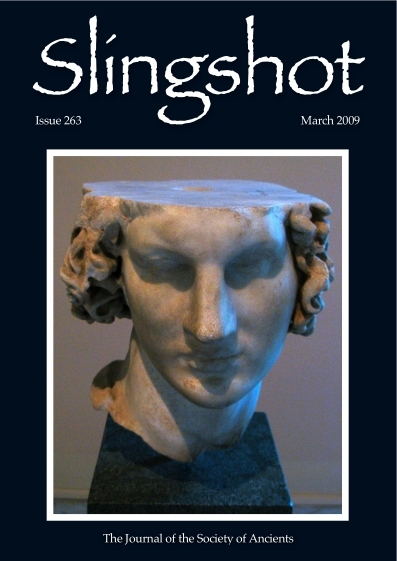 The latest issue of Slingshot (number 263, March 2009), the bi-monthly publication of the Society of Ancients, went to the printers last Monday. Apologies for the lateness of this issue. My understanding is that the issue has been delayed a further couple of days to accommodate the printing of membership cards, which are enclosed with the magazine, so it may be another week before it arrives with you. The incentive game is not included with this mailing and will be sent separately. The contents of Slingshot 263 are as follows. For games articles, I've indicated the relevant rule set where it's not immediately obvious from the title; with historical articles I've tried to indicate period if a similar issue applies.